The Shop – vegetarian and vegan sandwiches and salads available. Come along to create your very own seed bombs (mixtures of soil and seed which create wild flower gardens when thrown) and try some delicious creepy crawly snacks! 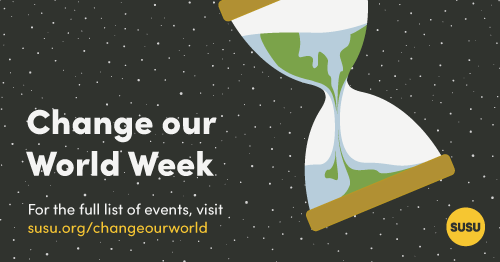 Join the Union and Student Life to celebrate everything planet Earth! Hear talks from Greenpeace, Grow Wild-Kew Gardens and The Woodland Trust and meet the RSPCA, The Wildlife Trusts, Cats Protection, Southern Water, Bumblebee Conservation Trust, EthiCo and more. Create your own herb garden, get your bike checked at the Bike Doctor, listen to live music from 17:00, and enjoy a free vegetarian BBQ! The Union’s shuttle bus will be available from 20:00 to get you home safe. Live music… pedal powered! Hop on one of our bikes and generate power for a musical evening. Join us to find out more about how we can positively change the world around us. We will be joined by Stand Up To Racism, Effective Altruism, Blackfish, Marxist Society, FemSoc, Self-Empowerment Society. Get ready to try I’m A Student….Get Me Out Of Here with some yummy bug tasting! The Union is hoping to cultivate our own bee hive! If you think you may be interested in helping to look after the hive, or you would like more information on beekeeping in general, come along to this introduction with Dr Chris Jackson. Afterwards, there will be the opportunity to apply for a short, intensive beekeeping course that will give you the skills you need to look after the bees this summer, starting Wednesday 02 May! Find out how you can get in involved with protecting the sea life in the Solent!